Technical Analysis and Elliott Wave Theory: Why 1120? The only issue is, that an Expanding Ending Diagonal (p. 37 in our bible) is very very rare... Furthermore the upwaves ([i],[iii],[v]) are supposed to be zigzags, and it's quite hard to count them in that way. 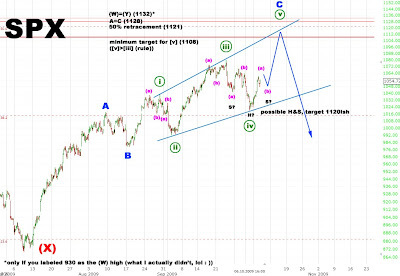 A move above 1070 should confirm this scenario, whereas a drop below 1020 indicates that we might be in a very bearish 1-2-i-ii scenario.